Did you know that cats 12 years and older are at a 28% greater risk of having Chronic Kidney Disease? Chronic kidney disease (CKD) is the persistent loss of kidney function over time. Healthy kidneys perform many important functions, most notably filtering the blood and making urine, so problems with kidney function can result in a variety of health problems for a cat. CKD is the most common kidney disease that may affect cats. 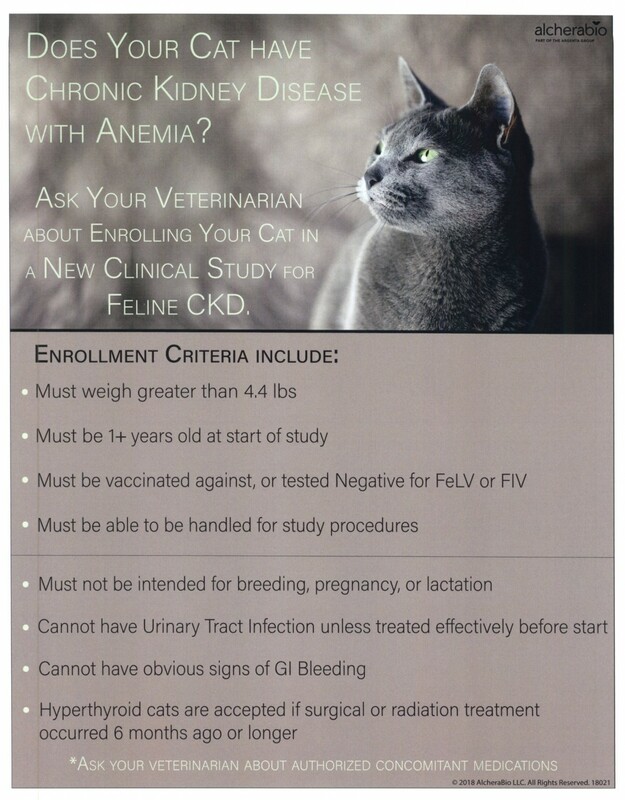 If you are concerned your cat has CKD don’t hesitate to contact us. • If your cat drinks excessively (aka. "Polydipsia"), urinates excessively (aka. "Polyuria"), has bloody or cloudy urine, or has subtle weight loss, you might want to have his/her kidney function checked by a veterinarian. • Did you know that an ammonia-like breath, brown-colored tongue and mouth ulcers (gums, tongue) could point toward kidney problems? Consult us if you are worried about your cat's health! • Cats are natural and fastidious groomers and sometimes even interrupt playing to smooth out an unruly patch of fur. A cat who is not keeping up appearances may not be feeling well. A dry, unkempt coat could indicate an underlying health issue, like Chronic Kidney Disease. If you are concerned about your furry friend's health, don't hesitate to contact us!